Though it no longer serves as a vital trade route and shipping corridor, it is impossible to overstate the lake’s role in shaping the region’s economics and ecology over the 400 years since Samuel de Champlain claimed its first European discovery. Still, the lake is much more than its 435 square miles of surface water. Its basin spans 8234 square miles, reaching west deep into the Adirondacks, east to the outer bounds of the Northeast Kingdom and south to a tiny, emerald-green lake in East Dorset. “The breadth and largesse of the lake is incredible to think of. You can travel two to three hours and still be in the watershed,” says Nicole Ballinger, communications and publications coordinator for the Lake Champlain Basin Program. Within that watershed are nine rivers and streams that feed the lake’s waters. 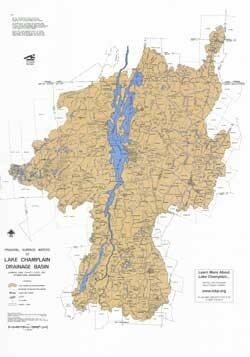 The health of these bodies of water — the Lamoille, the Missisquoi, the Poultney/Metawee and the Winooski rivers and Otter Creek in Vermont; and the Ausable, the Bouquet, the Chazy and the Saranac rivers in New York — determines the health of the lake and of the watershed’s 200,000 residents who get their drinking water there. But more than that, the watershed connects its inhabitants and makes them all part of the lake, whether they live in Castleton, Vt., or Keeseville, N.Y. Farmers are becoming more aware of the effects of phosphorus runoff in the inflows, and residents throughout the watershed are pitching in to restore riverbanks, create buffer zones and preserve wildlife habitat. This awareness of our connectedness is a fairly recent development, says Cynthia Scott, coordinator of the Missisquoi River Basin Association, and it helps define the evolving culture of the watershed. If the physical lake is defined by the sum of its water — in the case of Lake Champlain, 6.8 quadrillion gallons — then the cultural watershed can be defined as a sum of its people. Here are a few of their stories. Lake length: 120 miles. Lake Champlain flows from Whitehall, N.Y., north toward the U.S./Canadian border and its outlet at the Richelieu River in Québec. From there, the water joins the St. Lawrence River, which eventually drains into the Atlantic Ocean at the Gulf of St. Lawrence. Greatest depth: 400 ft. in the area between Charlotte, Vt., and Essex, N.Y.
Average lake depth: 64 ft.
Jim Sausville is a man of enviable patience. Maybe it has something to do with being a kayaker for much of his life. He’s had to wait for seasons to turn and rivers to flow before paddling the best water. Whatever the origin of his constancy, Sausville has been waiting a long time for his river, the graceful Saranac, to return to its optimal state, its state before humans dumped trash in its depths and built parking lots on its banks. Over the course of 15 years, Sausville’s steady stewardship and measured cheerleading have brought the river, his personal playground, back to its rightful place as centerpiece of the village. When Sausville, 58, moved to Saranac Lake, N.Y., in the early 1980s, the river wended through the village unnoticed by visitors and ignored by residents. Shop fronts faced away from it: “The village had basically turned its back on the river,” Sausville says. Industrial waste from the lumberyards and retail shops that backed up to the river was tossed indiscriminately. The water was a convenient dumping ground, and little thought was given to the effects the waste would have on the region, let alone on Lake Champlain, into which the Saranac empties 50 miles to the northeast. Sausville, a boatwright by trade, is a compact man with a neatly trimmed salt-and-pepper beard and rosy cheeks. When he’s not building or repairing boats, he’s cycling, hiking, backcountry skiing or paddling, depending on the season. 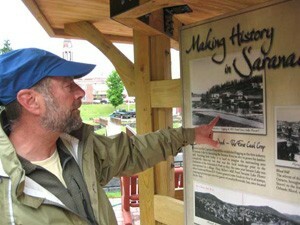 When the Saranac Lake village government decided to tackle river restoration, Sausville volunteered his considerable knowledge of the water and his boundless energy. After the village agreed to dredge a channel in the river to make it more accessible to paddlers, Sausville was confident in the community’s commitment, he recalls. In 1995, Sausville shepherded the installation of a whitewater practice area on the Saranac, right in the center of town. Today he still uses that area to teach beginning paddlers eddy turns and peel-outs. Since then, the village has set about improving the river, albeit slowly, one small section at a time. “This work has brought access to the river and forced people to clean it up and not just use it as a dump,” Sausville says. Today visitors to Saranac Lake, once the vacation destination of early-20th-century elites such as the Rockefellers, the Guggenheims and the Posts, will see the fruits of Sausville’s patience — a winding riverwalk dedicated just weeks ago. Volunteers, marshaled by Sausville and others on the River Corridor Commission, built a simple wooden and brick boardwalk along the riverbank, three quarters of a mile long. Engineers stabilized the banks with rusticated masonry, aesthetically appropriate to the rural environs. The village installed picnic tables and benches the length of the boardwalk. New interpretive signage highlighting the various fish, birds and insects that make their homes in or around the Saranac makes the river feel more integral to the village than it did before. This rehabilitation and rejuvenation of the river has been Sausville’s greatest accomplishment. And he only had to wait nearly two decades to see it realized. But watching older couples stroll on the riverwalk at night or youngsters fishing on the banks during the day makes the wait worth it. Estelle Loiselle considers herself lucky. The 92-year-old Winooski woman doesn’t make a big deal of the work or its attendant dangers. It’s just what people did during the war to get by. The mills along the Winooski River were the largest employer in the area, and, because they were manufacturing woolens for the military, the jobs paid relatively well. From 1901 to 1954, the American Woolen Company was the nation’s largest producer of woolen goods. The company took advantage of the churning river to power the looms that wove the wool. It employed hundreds of people like Loiselle and her late husband, Romeo, who worked there repairing machinery. Loiselle, a devout Catholic, is a sharp nonagenarian with a head of delicate white curls and twig-thin legs. She complains that her daughter’s cooking is making her fat and pats her round belly as proof. Her hearing is going and her eyesight is fuzzy, but she can tell stories about her life in Winooski for hours. Loiselle moved to the United States from Québec as a 28-year-old newlywed and settled in the Flats section of Winooski, where her husband grew up. Since English wasn’t her first language, a job where she didn’t have to speak was ideal. After a couple of years stamping blankets, she was transferred to another part of the mill where she was tasked with fixing sewing mistakes — an infinitely better job than the stamping, she recalls, because it was quiet and safe. She was far away from the rattling machines powered by the rushing Winooski River below the mill. That job, one of the best paying at the mill, allowed Loiselle and her husband to move out of her mother-in-law’s house and into their own home. In 1955, a year after the mill closed, Loiselle bought a two-story, three-bedroom clapboard house in the hill section of the city. 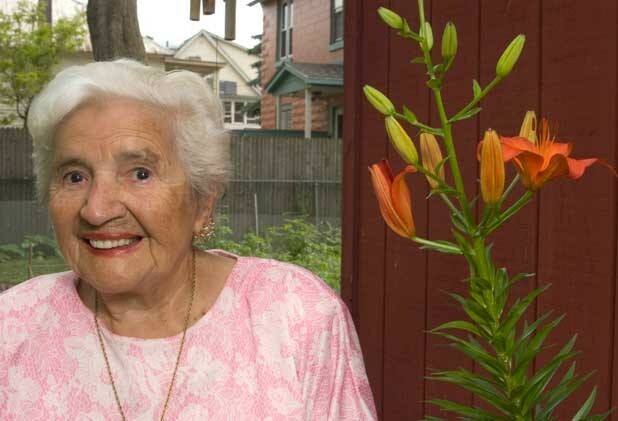 She and Romeo spent $5000 cash on the house — 10 years of savings. They had finally made it, and their address in the better part of town was proof of their status as a self-made, middle-class family. After the mill closed, Loiselle found work as a popcorn and peanut girl in a local store. Then she worked for the City of Winooski. She can’t remember a time when she wasn’t working, even when she was raising her six children. Only in the last couple of years has she stopped volunteering with her various church and senior groups. Carol Treadwell may be the only Girl Scout, past or present, ever to have earned a badge in rock collecting. 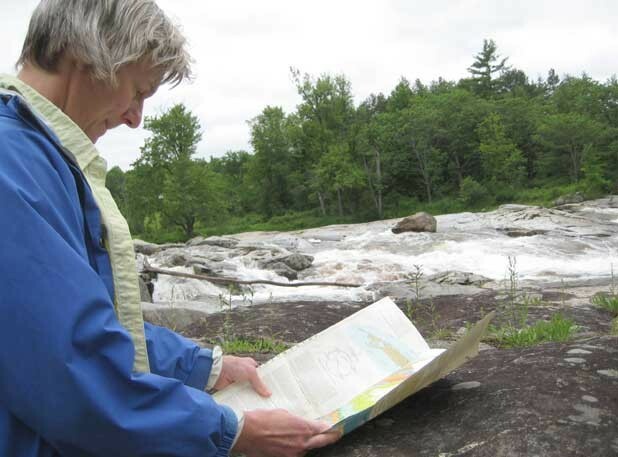 More than 30 years after receiving that scouting honor, Treadwell is still enamored of rocks, particularly those that make up her beloved Adirondack Mountains. She’s in her element discussing the geology of the Adirondacks and the rivers that run through them, particularly the Ausable. Treadwell, a fluvial geomorphologist, became hooked on rocks as a freshman in college. Three geology degrees later, she is making a living protecting them. “I’ve always loved to solve problems, and with geology, you’re solving problems with a limited bit of information,” Treadwell says. As the executive director of the Ausable River Association, Treadwell organizes projects that address erosion issues, water quality, invasive species and general stewardship of the river, which gets its name from the French phrase meaning “in the sand.” But what she really likes doing is talking about rocks. Treadwell, 46, is tall and lithe with sandy blond hair and energy to spare. Years of skiing, cycling and hiking all but three of the 46 High Peaks have kept the Lake Placid resident remarkably fit. She is keen to explain just what makes the Adirondacks so different from their neighboring peaks on the other side of Lake Champlain. Recalling the talks she’s given to so many elementary school classes, Treadwell outlines how the Adirondacks were pushed out of the Earth’s crust like a pimple, whereas the Green and White mountains to the east were created by a crumpling, or continental collision. Contrary to what many think, the Adirondacks are not part of the Appalachians, like the Greens and Whites; rather they are the southernmost part of the Canadian Shield, made from metamorphic rock as opposed to the sedimentary rock of Vermont’s peaks. The Adirondack Mountains are also younger than the Greens; the domal uplift that created them happened just 60 million years ago. The Taconic orogeny that brought the Green Mountains into existence occurred 400 million years before that. For her master’s thesis, Treadwell examined the tilt rate of fluvial terraces on the Ausable to determine whether the mountains are still rising. For the nonscientist, that means the river provided proof that the Adirondack dome is still rising by about one millimeter a year. During a visit to the East Branch of the Ausable, which cuts just beneath the village of Jay, Treadwell gushes about the rocks that compose the river’s bed. They are anorthosite, she says, an igneous rock that is found in very few places on Earth — as well as on the highlands of the moon. The rock contains large, opalescent crystals that shine when wet. To demonstrate, Treadwell takes a piece of anorthosite the size of a loaf of bread — one of her teaching tools — and licks it. The rock shimmers with pinks and blues. “I’m the only one allowed to lick this rock,” she jokes. Surface outcroppings of anorthosite are so rare that when the astronauts returned with the first moon-rock samples, they sought out Adirondack geologists to help them learn more, Treadwell says. Mike Manahan remembers the first fish he ever caught. He was 8 years old, standing on the banks of a brook near his home in Enosburg. With a primitive stick-and-string set-up, Manahan hooked an 8-inch-long trout. That was all it took — one modest catch, taken home and fried up by his grandmother — to make a lifelong, ardent fisherman out of him. 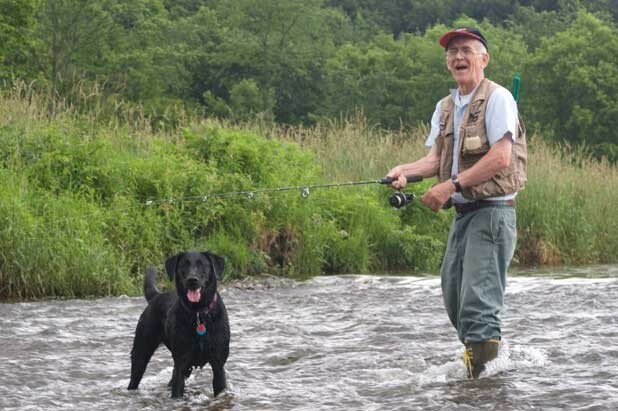 Manahan, now 68, lives less than a mile from the Missisquoi River, which teems with bass, trout and walleye, and he knows every good fishing spot from Highgate to Richford. His passion for fishing has made him into an uncompromising environmentalist. Get Manahan going on the state of fishing along the Missisquoi and its tributaries, and he’s not likely to stop. When talking about the absence of trout in the Trout River, which flows into the Missisquoi, Manahan jumps out of his chair and gesticulates wildly. He produces a missive he recently wrote to the Vermont Department of Fish and Wildlife, outlining his complaints. He’s serious about fishing, and by extension, about the effects of human irresponsibility on his hobby. In his years volunteering with the basin organization, Manahan has planted thousands of trees along the riverbank to form buffers between the region’s many farms and the water. He’s worked with farmers to educate them about the damaging effects of phosphorus runoff on the Missisquoi, and consequently, on his precious trout. Currently, he’s helping out with water quality sampling along the river. The trees Manahan has planted are helping stabilize the banks, which prevents the river from changing course rapidly. They also provide shade for fish and help keep the water cool. Warmer water doesn’t hold oxygen as well, and fish prefer to live in well-oxygenated water. Manahan’s environmentalism is always dual-purpose — he still fishes at least once a week from May to October. His mudroom is full of rods and reels. Though he has about nine rods, some of which he has never used, his favorite rod remains a basic set-up he bought in 1972 for $15.